Trapping During Closed Season: Except as explained in animal damage control laws, it is unlawful to trap for any species of wild bird, or any species of wild animal, which does not have an open trapping season. Advance Preparation: No person shall stake, hook, fasten or position a trap at any trap site location in the fields, forests or waters of the State prior to the opening day of the trapping season. In addition, there shall be no installation or placement of trapping implements, associated materials, or supplies or preparation of the site in the water or on the ice including the associated flowage, marsh, bog, brook, stream, river, pond, or lake prior to the beginning of the trapping season on beaver and muskrat. Capture of Non-target Species: Any animal caught during a closed season for that species, must be released alive immediately, except lynx and eagles (see What to do if I Catch a Lynx). In the unlikely event that an eagle is caught in a trap, a biologist or game warden must be notified immediately, before the animal is released. If a non-target species is found dead in the trap, the incident must be reported to a game warden as soon as possible and the animal must be turned over to the Department. Carrying a Firearm: Any licensed trapper is allowed to carry a firearm at any time while tending traps (including nights and Sundays) for the sole purpose of dispatching trapped animals. Note: A valid hunting license allows the use of a firearm for legal hunting purposes. 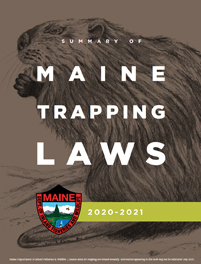 Any person prohibited from possessing a firearm under the Maine Revised Statutes, Title 15, Section 393 is prohibited from carrying a firearm during the open trapping season for the purpose of dispatching animals unless they have obtained a valid permit to carry a firearm. Disturbing Traps: It is unlawful to take or disturb any trap, or any wild animal which is caught in a trap, without permission from the owner of the trap. An individual convicted of disturbing traps, will lose any license in effect, and be ineligible to purchase any license issued by the Department for 3 years. Furbearer Hunting: The use of a firearm or bow and arrow is permitted to hunt for bobcat, coyote, red and grey fox, opossum, raccoon, red squirrel and skunk during the open hunting season on these animals. See the Maine Summary of Hunting Laws for more information. It is unlawful to hunt for beaver, fisher, marten, mink, muskrat, otter, or weasel at any time. Setback Distance: Traps are required to be set at least 4 feet away from another person's beaver traps; however, as a matter of common courtesy, traps should be set a reasonable distance away from any trap which has been set by someone else. See regulations related to setback distances from beaver houses, beaver dams, and muskrat houses. Trapping Within the Built-up Section of a Town: Trapping is only permitted within ½ of the built-up section of a city or town with the use of cage-type live traps and drowning sets, unless trapping on property owned by the trapper. Trap Identification: Each trap set must be clearly labeled with trapper's full name and address. If two people are trapping together, it is not necessary to have the name and address of both trappers on each trap. Note: The recommended method for labeling traps is to attach a small metal tag to each trap chain with a piece of wire. The tag should be preprinted with your name and address. Marking Beaver Traps: The law requires that each trap is labeled with trapper's name and address. However, most trappers label both their trap and the pole to which their trap is fastened. This eliminates the need for a warden to chop out or otherwise disturb the set in order to identify the trapper. It is a Department policy that if the trapper's name and address are displayed on the trap pole above the ice, the warden will not chop out the set to check the trap for a label. Visible Bait: Foothold or killer-type traps must not be set within 50 yards of bait that is visible from above. Bait may be used for trapping if it is completely covered to prevent it from being seen from above, and it must be covered in such a way as to withstand wind action and other normal environmental conditions. Killer-type traps are not permitted. Traps in the water are not permitted. Exposed bait or visible attractors are not permitted. Trappers are permitted to keep any incidental opossum, raccoon or skunk that are caught in fox and coyote traps. Any other furbearing animal caught incidentally in fox and coyote traps must be released alive immediately, except lynx (see What to do if I Catch a Lynx) or, if found dead, must be left there, in the trap, and reported to a game warden as soon as possible. foothold traps on "covered floats." A covered float is defined as a float completely covered on the sides and top with hardware cloth, screen, or other similar material, having a mesh size no greater than 1/2 inch square. Access to the float must be limited to openings at the extreme ends of the float and the openings must not exceed 7 inches in height, or 14 inches in width. The use of exposed bait or visible attractor on covered floats is prohibited. Only one trap may be placed per float; the trap must be recessed 3 inches or greater from any opening in the cover; the trap chain or wire must be at least 3 feet long; and the maximum foothold trap size for covered floats sets is No. 1 1/2. The only traps allowed are foothold traps not larger than size number 1 1/2, killer-type traps with a jaw spread of not more than 5 inches and colony traps (see Colony Trap Restrictions). The use any exposed bait or visible attractors are not permitted. Keeping incidental mink or raccoon caught in muskrat traps is permitted. Any other furbearing animal caught incidentally in a muskrat trap must be immediately released alive, or, if found dead, must be left there in the trap and be reported to a game warden as soon as possible. Traps set for beaver in October, November and April are restricted to killer-type traps and drowning sets. No person shall use meat or fish as bait in trapping for beaver. No person shall make advanced preparation on the trapping grounds for the taking of beaver or muskrat prior to the open season on these animals. within 4 feet of a beaver trap that has been set by another trapper. However, in Wildlife Management Districts 1, 2, 4, 8, 9, and 10 there is no required setback distance from an active beaver dam, and in Wildlife Management Districts 1, 2, 3, 4, 5, and 6 there is no required setback distance from a beaver house. restricting the removal of nuisance beaver by agents of the Commissioner prior to the beaver trapping season. Except in emergency situations, no nuisance beaver will be removed within 30 days of the opening day of the beaver trapping season in that area. A list of locations where beaver have been removed within 30 days of the opening of the beaver trapping season will be maintained at regional offices. The above provisions will maintain a greater level of beaver trapping opportunity. It is illegal to destroy or damage a muskrat house or den, a beaver house or a beaver dam. You are not allowed to set a trap within 10 feet of a muskrat house, a muskrat den, or a beaver house, and you are not allowed to set a trap within 5 feet of an active beaver dam. A beaver dam is considered inactive if it is breached or is no longer being maintained by a beaver and shows no evidence of beaver activity. The exceptions to this rule are that in Wildlife Management Districts 1, 2, 4, 8, 9, and 10 there is no required setback distance from an active beaver dam, and in Wildlife Management Districts 1, 2, 3, 4, 5, and 6 there is no required setback distance from a beaver house. Muskrat Den: A muskrat den is any cavity which is capped by muskrats with vegetative matter, including but not limited to hollow stumps and bank cavities. Holes in the bank not capped with vegetative matter are not considered to be muskrat dens. Beaver House: The term beaver house includes any cavity in the bank which is capped by beaver with mud and sticks. Holes in the bank not capped with mud and sticks are not considered to be beaver houses. House: Measured from where the nearest edge of the house meets water or ice. In the case of capped cavity on the bank, distance will be measured from where the nearest intersection edge of the cap meets the ground, water, or ice. Dens: Measured from the nearest opening. Dams: Beaver dams should be measured from the where the nearest edge of the dam meets ground, water, or ice. Trappers are not allowed to take or possess more than 25 marten or 10 fisher during the trapping season. Although it is not permitted to trap for mink or otter after the general trapping season closes, trappers may keep a mink or otter if caught by accident during the beaver trapping season. Foothold traps must not be set above snow or ground level. It is unlawful to use a trap with teeth on the jaws unless when set, placed, and tended, the trap is completely covered with water. All foothold traps set on dry land must have at least three swiveling points and the chain must be centrally mounted at the base of the trap. 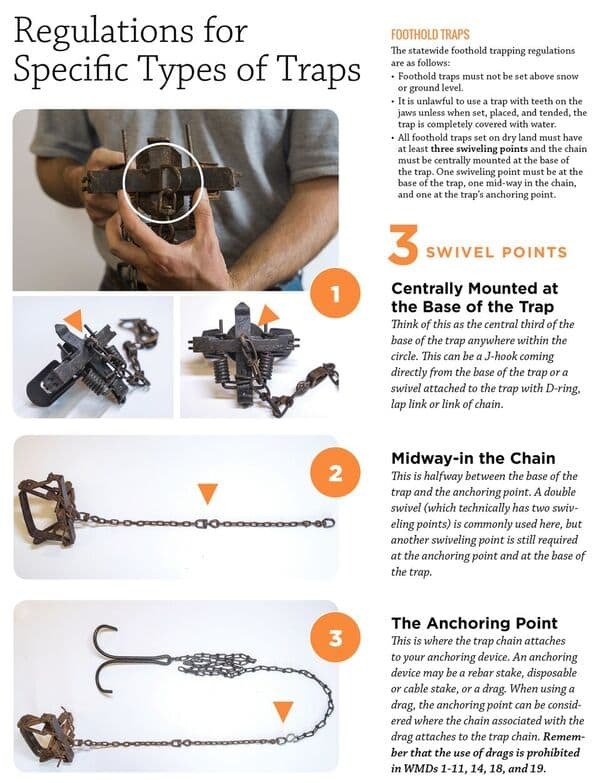 One swiveling point must be at the base of the trap, one mid-way in the chain, and one at the trap's anchoring point. Think of this as the central third of the base of the trap anywhere within the circle. This can be a J-hook coming directly from the base of the trap or a swivel attached to the trap with D-ring, lap link or link of chain. This is halfway between the base of the trap and the anchoring point. A double swivel (which technically has two swiveling points) is commonly used here, but another swiveling point is still required at the anchoring point and at the base of the trap. This is where the trap chain attaches to your anchoring device. An anchoring device may be a rebar stake, disposable or cable stake, or a drag. When using a drag, the anchoring point can be considered where the chain associated with the drag attaches to the trap chain. Remember that the use of drags is prohibited in WMD's 1-11, 14, 18 and 19. Foothold traps must be securely anchored to the ground. The use of drags is prohibited in these WMDs. Foothold traps must have the catch circle cleared of woody vegetation, debris and manmade material that could cause entanglement of a trapped animal. Small sticks and rocks, and rotten/decaying woody material may be used for stepping guides, blocking, and backing for trap sets, if they are not rooted to the ground. 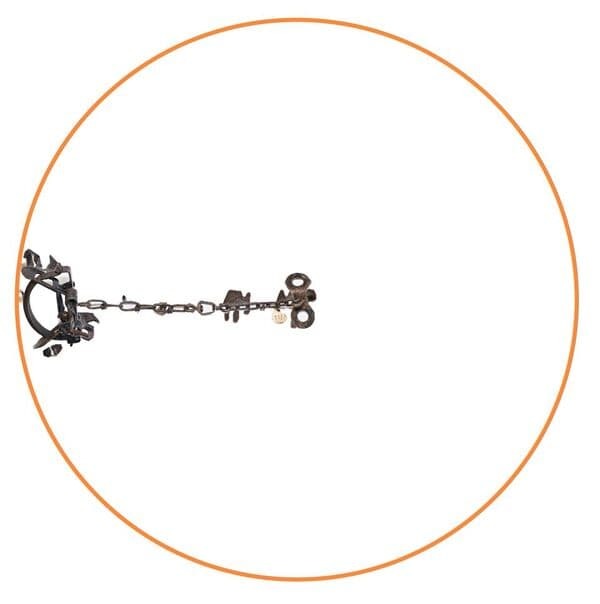 A catch circle is defined as the area that can be circumscribed by the outer edge of a trap when the trap and trap chain are fully extended and moved in a circle (360°) around the anchoring point. These restrictions do not apply to foothold traps that when set, placed, and tended are fully or partially covered by water, those that are set on a muskrat "float", or dog-proof raccoon traps. In WMDs 1-6 and 8-11 no foothold trap may be used that has an inside jaw spread of more than 5 3/8 inches unless when set, placed, and tended the trap is fully or partially covered by water. The catch circle is defined as the area that can be circumscribed by the outer edge of a trap when the trap and trap chain are fully extended and moved in a circle (360°) around the anchoring point. The photo below provides a visual example of this rule. Dog proof raccoon traps that are designed primarily to catch raccoons and avoid incidental catches of other animals may be used throughout the trapping season. Cage-type live traps may be used to trap for all legal species of furbearing animal, except that in WMDs 1–6 and 8–11, no cage trap which has an opening of more than 13 inches in width or more than 13 inches in height may be used unless the cage trap is being used (1) for wildlife research and survey activities; (2) for the removal of animals that are causing damage to property; or (3) to capture bear. Foot snares (cable traps) may be used only to trap for bear. See Bear Trapping for more information. All colony traps must be set so as to remain completely under water at all times. For tending purposes, colony traps are considered killer-type traps. For information and rules on killer-type (conibear) traps, see Killer-Type (Conibear) Trap Rules. Wooden-based rat traps may be set on land for weasel and red squirrel trapping if recessed in a wooden box with a hole no larger than 2 inches in diameter. All traps set in organized towns must be tended daily, except for killer-type traps, drowning sets, and under-ice drowning sets. Each killer-type trap or drowning set, except under-ice drowning sets, in organized towns must be tended at least once every three calendar days except if the drowning set is within ½ mile of the built up section of town, then it must be checked every 24 hours. All traps set in unorganized towns must be tended daily, except for killer-type traps, drowning sets, and under-ice drowning sets. Each killer-type trap or drowning set, except under-ice drowning sets, in unorganized towns must be tended at least once in every 5 calendar days. For enforcement and information purposes, all drowning sets for beaver and muskrat during January and February will be considered "under ice drowning sets" which have no tending requirement. 5 days for killer-type traps and drowning sets in unorganized towns.